The GIGABYTE MW51-HP0 is a workstation-centric model which is designed for professional use and supports the Intel Xeon-W Skylake based range of processors. 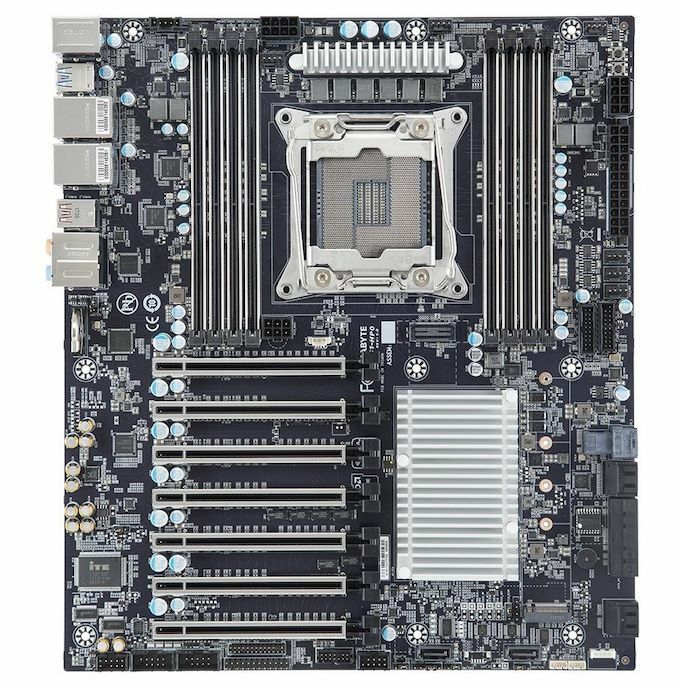 The MW51-HP0 uses the CEB form factor which means it’ll fit into an E-ATX chassis, but the location of the LGA-2066 socket is slightly different than what you'd find on a consumer-based board. 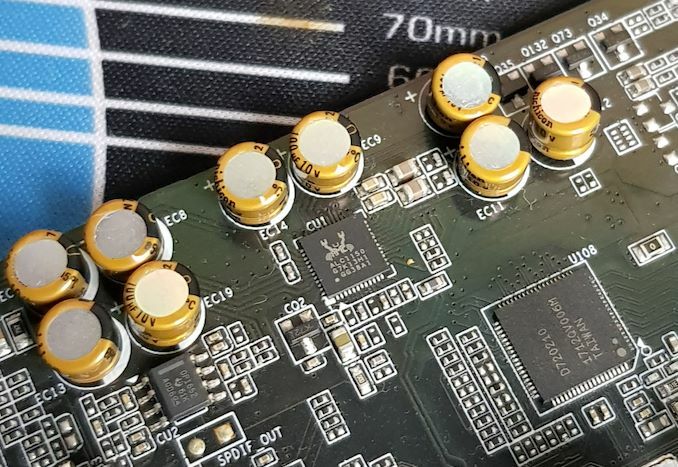 The board's silver and black theme are consistent with a professional-grade board; the PCB is matte black with silver heatsinks and slot armor. As expected from a professional-grade workstation motherboard, a lot of the focus on features is in the hardware support, and as a result the MW51-HP0 has a lot of headers and jumpers. A total of six 4-pin headers are dotted around the edge of the board; one dedicated to the CPU fan and five for chassis fans. A PBS connector is located at the top left-hand side of the board, with two of the 4-pin headers also along the top. 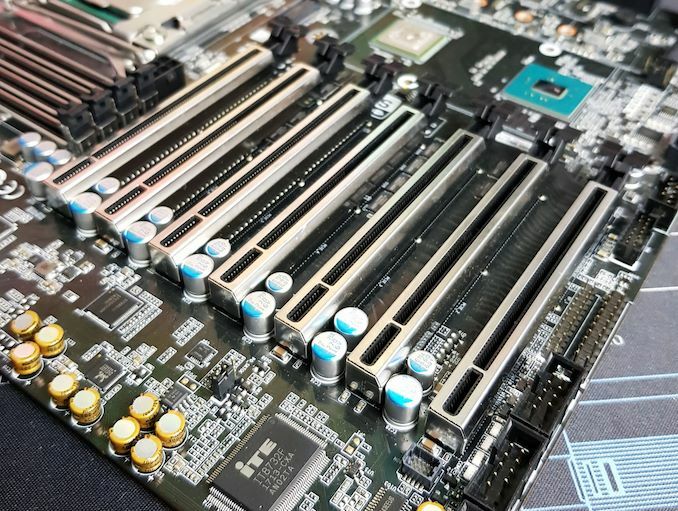 Flanking either side of the LGA-2066 socket is four RAM slots with the board offering eight in total. The MW51-HP0 allows for memory speeds up to DDR4-2666 at 1.2 V, with both RDIMMs and LRDIMMs supported at 64GB/DIMM and 128GB/DIMM respectively. Meanwhile, underneath the CPU socket is an XDP port for debugging, which for users looking to use XDP, is available separately. On the storage front, the MW51-HP0 offers a total of ten SATA ports, with eight deriving from the C422 chipset and the other two being controlled by a Marvel 88SE9172 SATA controller. RAID 0, 1, 5 and 10 arrays are supported between the ports. 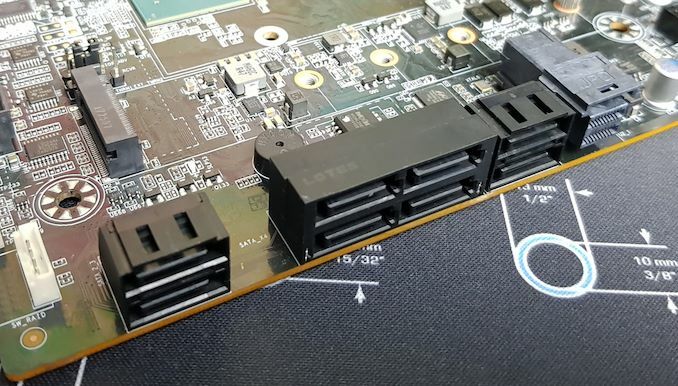 A single M.2 slot is also present, which is wired up for PCIe 3.0 x4 and can accomodate sticks up to 22110 in size. Next to the SATA ports on the right-hand side of the board we also find a single U.2 connector, offering support for Mini-SAS drives. Meanwhile at the bottom right-hand side of the board are two SATA DOM connectors, which also includes two headers. Finally, located next to these is a VROC connector. Due to the layout of the full-length PCIe 3.0 x16 slots, the MW51-HP0 can accommodate up to four dual-slot PCIe cards or up to seven single slot cards. Each of the slots features a metal slot reinforcer. Technically the board has four slots which operate at x16, but ignoring the top slot and its dedicated PCIe lanes, the slot below it also drops to x8. This means that the bottom six slots are sharing bandwidth in pairs of two. The onboard audio is provided by a Realtek ALC1150 HD audio codec and is surrounded by nine gold Japanese audio capacitors. Located just above this on the board is the BIOS battery which features a traditional jumper to reset the CMOS. Along the bottom of the board is the majority of the MW51-HP0’s headers and switches. From left to right is a front panel HD audio header, a pair of serial port headers, a front panel header, a single HDD back plane header, a TPM connector, and a force ME update jumper. Also present is the two SATA DOM connectors, a clear supervisor password jumper, a BIOS recovery jumper and a pair of SATA SPGIO connectors. To keep things simple, GIGABYTE has included the two SATA ports which support SATA DOM within the same area and both ports feature straight-angled connectors. In the top right-hand corner is a power switch and a reset switch, which are right next to one of the 8-pin 12 V CPU power inputs. There is a further second 8-pin 12 V CPU power input on the board as well, which is located just above the LGA-2066 socket. The board uses a 24-pin 12 V ATX power connector and just south of this are three of the chassis fan headers and two USB 3.0 headers. Touching more on the USB capabilities of the board, the GIGABYTE MW51-HP0 has plenty of USB ports on the rear panel. All told there are two USB 3.1 G2 ports (Type-A and Type-C) and eight USB 3.1 G1 Type-A ports. Notably, the USB 3.1 G2 Type-C connector can deliver up to 3A at 5V for high drain devices and/or slightly faster charging. Meanwhile GIGABYTE has included two USB 3.1 G1 headers (four ports) and a single USB 2.0 header (two ports) to allow users room for expansion. Also located on the rear panel is a PS/2 combo port, five 3.5 mm color-coded audio jacks and an S/PDIF optical output powered by a Realtek ALC1150 HD audio codec, and two RJ45 ports each controlled by individual Intel I210-AT GbE NICs. Big consumer stuff has, well slowed down. Sky Lake was released 3.5 years ago and since then Intel has boosted clocked, bumped up core counts and polished the chipset. AMD released Ryzen which got lots of coverage but the Zen+ refresh was mainly polishing off the first release. Zen 2 is still a little bit away so news will at least pick up on the consumer CPU side soon. The GPU side of things hasn't been that exciting as AMD and nVidia are seemingly content where they are in the market. The mining boom shifted prices upward which neither company is eager to reverse. The GTX 1660 Ti is actually a fairly big thing for consumers but that level of performance could be had years ago if you had the cash back then for a high end card. AMD's Navi will be another step forward for consumer but again will be over shadowed by the previous generation of highend hardware that carried higher prices. I hope the next big thing is a wider product line up of gaming displays now that HDMI 2.1 has adopted variable refresh rate support, nVidia supports Freesync displays (soft of) and Intel will finally be adding Freesync support too. Things are lining up for this to go mainstream. Though much like CPU and GPU news, variable refresh rate support has been around for years on other hardware. I see 2.5 and 5 Gbit hardware taking of on the consumer side along with 802.11ax (Wifi 6) enabled devices. Wireless is starting to move beyond a gigabit of bandwidth so the wired side of connectivity also has to evolve. Though it feels odd celebrating the release of 2.5 and 5 Gbit speeds when 10 Gbit has been around for years. "A total of eight DDR4 channels are present and allow users to run memory in quad-channel memory mode"
You see, this is how to report a typo (or "thinko"). No sarcasm, attacks, or diatribe about how Anandtech must be a shill for the reviewed item's manufacturer.